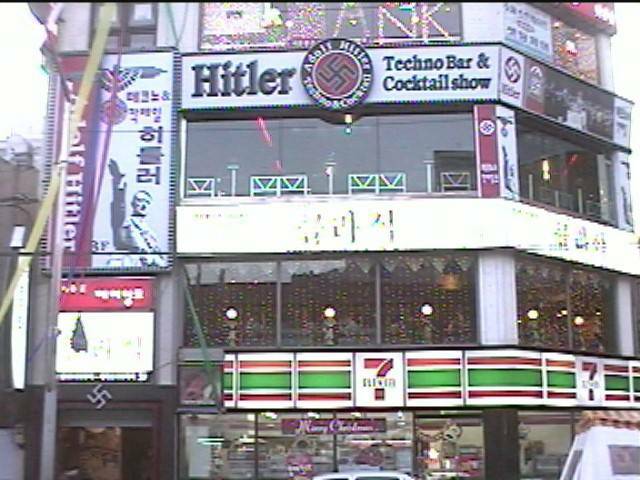 I first heard about the Hitler bar on our Discussion Board. I thought I knew what to expect, but was still shocked to see the neon swastikas and larger than life Hitler saluting next to the 7/11. While trying to discreetly photograph the Hitler writing that is painted on the walls leading up to the bar, a man approached and asked what we were doing. It turned out to be the owner, Mr. Hong, who invited us in, brought us a couple of orange juices and answered a few questions. "Why did you choose Hitler as the theme for your bar?" I wanted to design a beer bar with something shocking that would attract the young generation. Beer got me thinking about Germany (the home of beer) which made me think of Hitler. "What do you personally think of Hitler and his ideas?" Well, of course, I learned that he was a 'bad guy' and did many bad things, but he is no different than Alexander the Great or Gengis Khan. They were all conquerors who killed many people and they are all 'big men' in the sense of their notoriety living on long after they died. "What do you want to say to who are upset or angered by the idea of a Hitler Bar?" I sort of understand why they are upset, but not completely. The other day, two Canadians came in. They were very angry and yelled at me. I wanted to tell them that I'm not supporting Hitler's ideas, it's just a style of decoration I chose to appeal to the new generation. I didn't mean to create bad feelings with foreigners. As we talked more, Mr. Hong seemed to have some regrets about his choice of themes, but having spent more than 50,000,000 won on decor, he didn't know what he was going to do. He does plan to replace the square sign of Dicaprio and Winslet next to the 7/11 banner with an English message explaining that his decor has no ideological meaning and was not meant to offend. He also said he would send a message to Pusanweb soon addressing the situation. I left feeling that Mr. Hong was not a bad person, just a guy who thought he had a great idea for a bar and was genuinely surprised by the negative reaction. 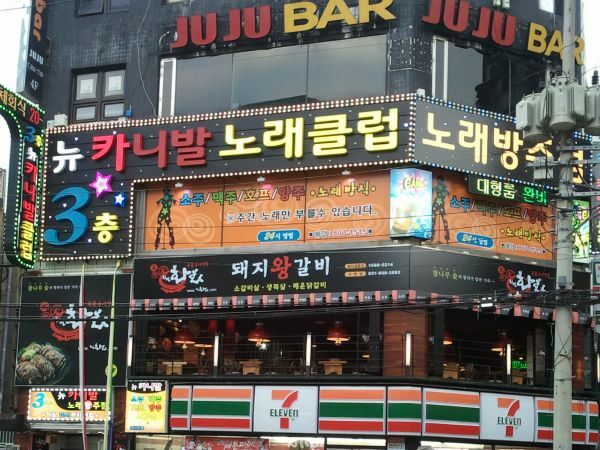 In discussing this with other Koreans afterward, I was shocked by how different our thinking was on the subject. I haven't talked to that many Koreans or foreigners about this and the hour is quite late as I type this, so I don't mean to make any unwarranted generalizations. I do my best to avoid the 'Koreans this and Foreigners that' kind of thinking and one of the main goals of this site is to encourage mutual understanding between the local and foreign communities here. I think we have our work cut out for ourselves on this one. In hopes of encouraging that mutual understanding, I encourage visitors to (civilly) express their views on our Discussion Board. ---------------------------------------------- Below is a rough tranlation of the note that just arrived from Mr. Hong and the original Korean. I am the owner of "Adolph Hitler Bar". 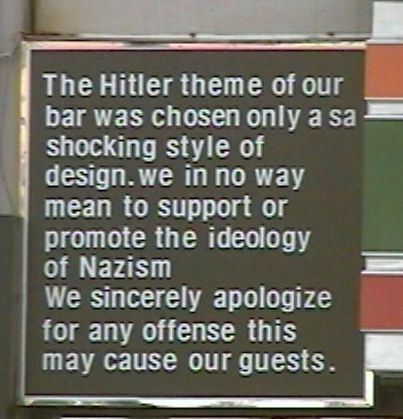 bar named "Hitler". 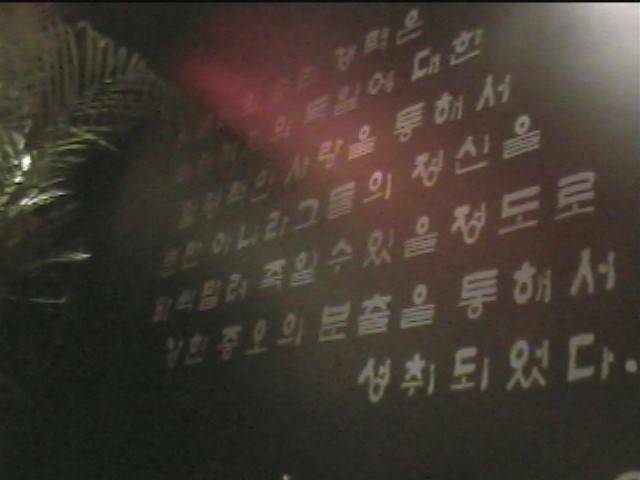 But I couldn't answer their questions nor explain my thoughts because of the difficulties of different languages. I'd like to say that I don't believe that Hitler was a good person either. I can totally understand why foreigners are upset. I've learned his brutalities against the peace of the world from books, TV and movies. As you know, Korean had a similar situation with Japan during WW2. saw a bar name "HiroHitto " in other countries, I should feel the same way. I am not a Nazi, the bar name came out at a meeting with interior designer. history point of view when picking the name. The name "Hitler" was totally meaningless, it was nothing more than a material for the business. without being able to consider how foreigners might feel. I also thank to Mr. Lebow and his wife for letting me know my big mistake and giving me the chance to publish a written apology. 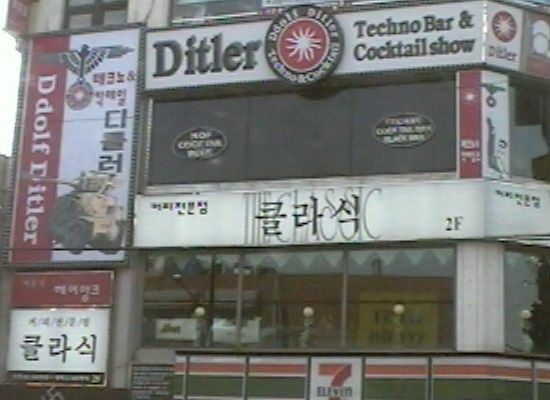 Epilogue (July 2003): After protests from near and far, the owners of the bar first renamed it to 'Ditler' and then to 'Ceasar'. We are not certain if ownership has changed or how business is still going.